In this world of a continuously evolving digital market, it is important for every business to change with time and adapt to the changing times in order to obtain success. Landing page takes the business to new heights if designed properly. Though designing landing page may seem to be an easy task and it is I would conclude but it is to be kept in mind that it is pivotal that is evolving as well. The main purpose of the landing page is to try to persuade a potential visitor to take action by completing a transaction. This is accomplished by providing a form that needs to be filled out. The visitor information is obtained in order to add the visitor’s email address to a mailing list as a prospect. An email campaign can then be developed based on responses to landing pages. The goal that is kept in mind while designing a landing page is to capture as much information about the visitor as possible. The general goal of a landing page is to convert site visitors into sales or leads. If the goal is to obtain a lead, the landing page will include some method for the visitor to get in contact with the company, usually a phone number, or an inquiry form. What is Lead Generation Landing Pages? 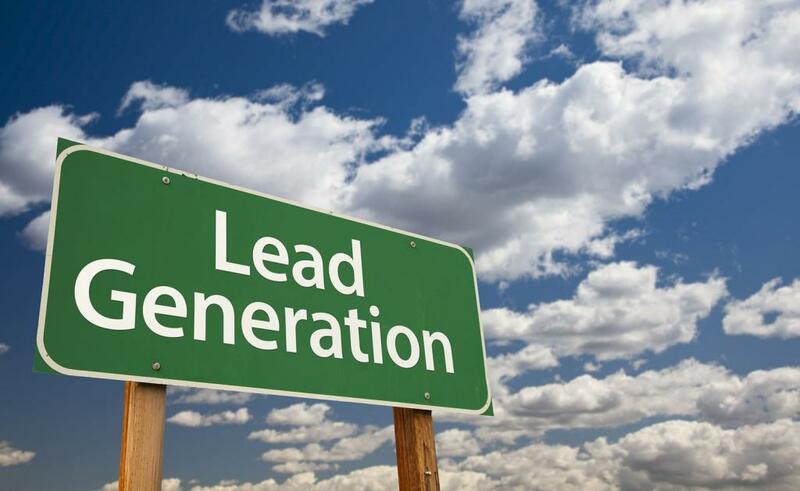 Lead gen landing pages are specifically designed for the sole purpose of capturing personal information about a prospect or a potential customer for the organization and the information includes elements such as name, email address, phone number, company size, etc. which is later used to nurture those prospects down the marketing funnel for the business organization. This becomes crucial because, without leads, any organization will never be able to generate customers which can never be considered good for the organization. • The page focuses on the policy of minimal copy and also ensures that a bulleted list do not clutter the page further highlighting the requisite information important for the users. • The security badges which are situated below this lead gen landing page form allows the people to know that their personal information is safe with the organization ensuring more loyalty towards the service providers. • The form and CTA button contrast with the rest of the page. • The headlines are unremarkable and don’t convey any benefit at all. • The phone number isn’t click-to-call. Changing that would make mobile visitors’ lives so much easier. • The best thing about this type of landing page is the option or the information provided by the “How-To” headlines as this implies that the reader will gain valuable knowledge by claiming any such offer available on the landing page of the website. Moreover, the free offer makes it hard for people to turn it down. Whenever the organization is offering something for free, the same should be emphasized throughout your page time and again. • Further, the pre-populated form makes completing it easy, relieving any friction involved with filling out so many fields. Also, the Limited copy part which is broken up into sub-heads makes this page a breeze to get through and also easy to understand for the customers. 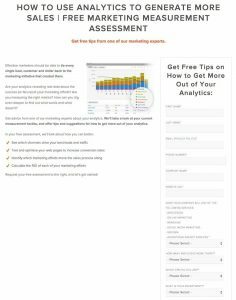 • This long form is meant to generate high-quality leads and for the while, a company like HubSpot can probably afford to turn away the people who aren’t willing to fill out all 12 of their form fields, most businesses can’t. Use a longer form to generate higher quality leads, but don’t get excessive with 12. 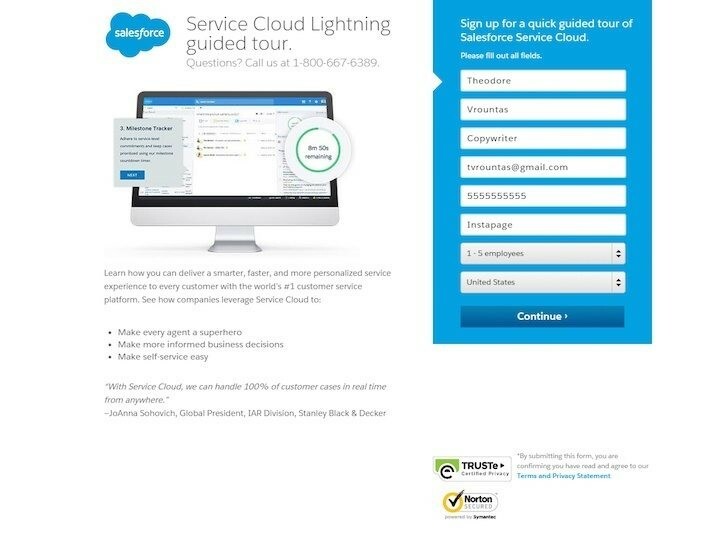 • The image on this landing page doesn’t add any value to the landing page. 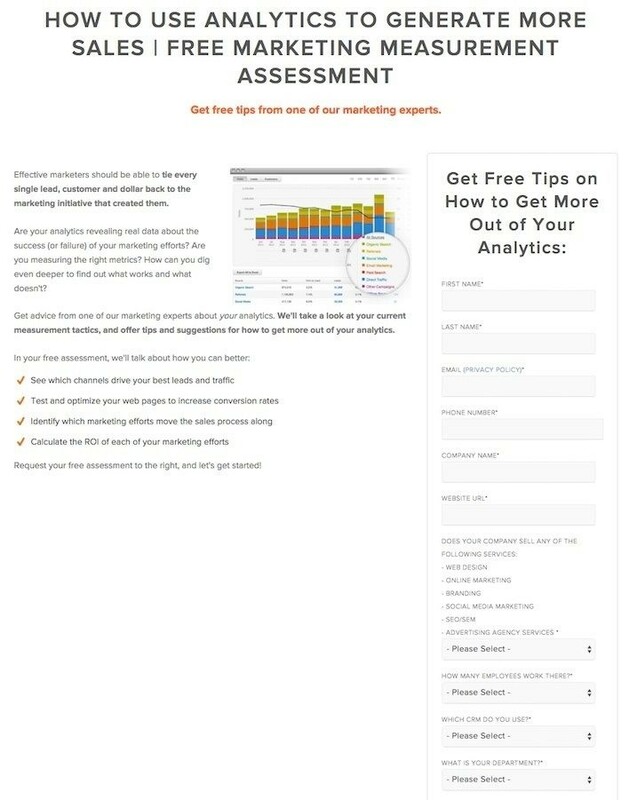 Is that a real screenshot of their analytics dashboard, or is it simply a placeholder? Either way, it’s not persuasive, so it shouldn’t be here. • Moreover, the Bullet-point copy geared toward the prospect makes it easy for readers to get through the information requisite for them to know about the services provided by the organization. • The visual cue (arrow) pointing to the CTA button as the most important action to take on the page as it attracts the potential customers towards the landing page. • The message under the CTA button also makes it clear that the business values the privacy of its customers which builds loyalty and trust amongst the customers and making it all the more likely that readers will feel comfortable handing over their information. • The testimonial is from the business that’s advertising the product. • The image on this page doesn’t add value at all. So why is it here? Images can boost conversions, but only if they enhance the page. • The most interesting part of this landing page is the color combination. Both the form and CTA are having contrasting colors which work in the favor of the organization as it helps to draw the attention of the visitors to that particular part of the landing page. 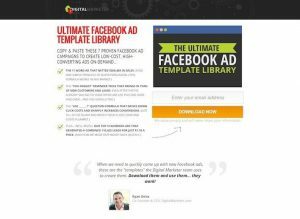 • The short blurb underneath the CTA button makes the reader more comfortable with signing up by reaffirming the fact that there are no obligations involved. • Company badges at the bottom of the page establish trust and legitimacy ensuring the customers about the privacy of the information provided. • The slider in the middle of the landing page can be said to be somewhat distracting — taking the attention away from the form and CTA for any potential customer. 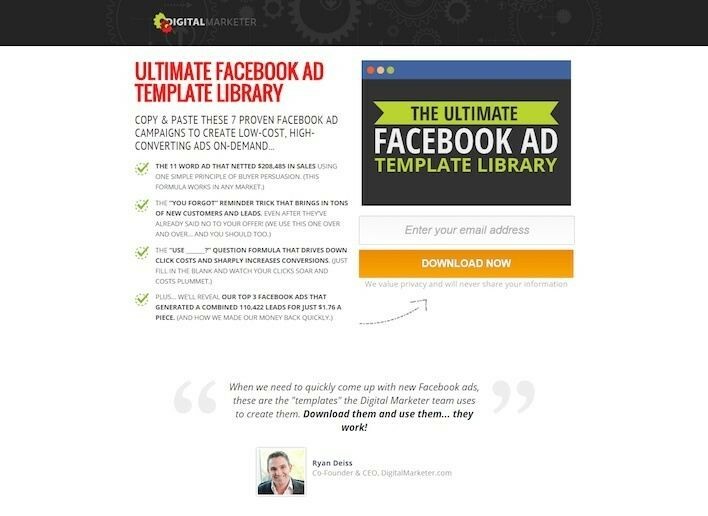 Those are enough best lead generation landing pages examples you can copy from. Better yet, save on costs and time by getting one of our well-priced templates.